William Bradford, a Philadelphia native, was the son of patriot and printer William Bradford (1722-1791) and his wife Rachel Budd. The elder William Bradford was Benjamin Franklin’s rival and publisher of The Weekly Advertiser. 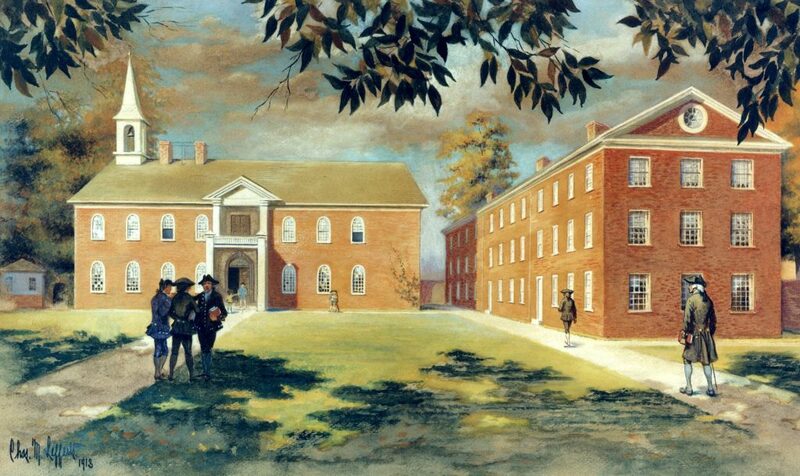 The younger Bradford began his formal education at the Academy of Philadelphia, where he was a student from 1762 to 1765. He then continued his studies in Princeton, first under the tutelage of Reverend Richard Treat and then as a student at Princeton College for three years. After graduating from Princeton with an A.B. degree in 1772, Bradford pursued further studies of history and morality to receive his A.M. degree in 1775. At Princeton his classmates included his close friend James Madison as well as Hugh Henry Breckenridge and Aaron Burr. After college, Bradford studied law under Edward Shippen, later Chief Justice of Pennsylvania. During the Revolutionary War, Bradford volunteered as a private, but soon became a major, captain, and then a colonel in the Continental Army. His war service included Valley Forge, White Plains, Fredericksborough, and Raritan before poor health forced him to resign in 1779. Bradford then began practicing law in York, Pennsylvania, but was very soon called into public service. In 1780, the 25-year old Bradford became Pennsylvania’s Attorney General and also the state’s Register of the High Court of Appeals. He served as Attorney General until 1791, when he was appointed a Justice of the Pennsylvania Supreme Court. In 1794 he moved from the state to the national level, serving as United States Attorney General until his death in 1795. Bradford’s accomplishments led to his election to the American Philosophical Society in 1785. In 1784, Bradford married Susan Vergereau Boudinot, the only daughter of Elias Boudinot. Boudinot, who had also attended the Academy of Philadelphia, had been a New Jersey delegate to the Continental Congress and would be elected as a New Jersey representative to the United States Congress from 1789 to 1795. Bradford’s connection with Penn, begun with his student days in the Academy, was renewed in 1781 when he was awarded an honorary A.M. from the University of the State of Pennsylvania. As the Attorney General of Pennsylvania, Bradford also served as an ex officio member of the University of the State of Pennsylvania’s Board of Trustees from 1780 to 1791.